For the ultimate in power and hill-climbing performance the A-Model Fairway Mowers offer turbocharged diesel engines. The A-Model utilizes a 37.1 hp* (27.7 kW) at 2600 rpm turbocharged diesel engine providing plenty of reserve power for optimum cutting and hill-climbing performance across a wide range of conditions. *Engine horsepower and torque information are provided by the engine manufacturer to be used for comparison purposes only. Actual operating horsepower and torque will be less. Refer to the engine manufacturer’s website for additional information. The E-Cut™ Hybrid Fairway Mowers are unique in that electrical power is used to minimize hydraulic leak opportunities in the reel circuit, but an engine is utilized to ensure optimal performance throughout the day. This presents an opportunity to further enhance machine performance through reduced sound levels and improved fuel savings, by running the machine at less-than-full throttle. When running the E-Cut Hybrid machines at the recommended reduced setting it does not sacrifice cut quality as the reel speed is still maintained at approximately 2200 rpm. 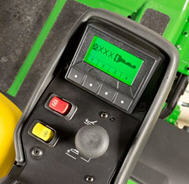 This reduced throttle setting is set quick and easy using the label system located by the throttle on the command arm. Simply move the throttle lever to align with the white mark that indicates the reduce rpm setting, and then use the TechControl to quickly adjust mow speed. The machine is ready to mow using the reduced throttle setting. The 7500A and 8000A E-Cut™ Hybrid Fairway Mowers can be effectively run in mow at an engine rpm reduced to 2300 rpm. At this operating rpm, operators will experience noise reductions when compared to running the machines at full throttle. In addition to the reduced sound levels, the operation at this engine rpm will reduce fuel usage due to slower engine rpm. Comparisons have shown that, depending on conditions and usage, fuel savings can be as high as 30 percent when running the machine at 2300 rpm as opposed to running at full throttle required by traditional hydraulic machines. Ninety percent of all hydraulic leaks occur in the reel hydraulic circuit, mainly due to the necessity of having flexible hoses extending from the front of the machine for the front reels. These hoses see a lot of flexing during the mowing day as cutting units are raised and lowered. Cutting units also steer and float to follow undulations, increasing fatigue for the reel motor hoses. The 7500A and 8000A E-Cut™ Hybrid Fairway Mowers have eliminated all reel circuit leak points by removing all hydraulics from the cutting unit drive circuit. Fewer hydraulic components leads to fewer leaks, increasing confidence that the finely manicured turf will not be damaged by hot hydraulic oil spilled onto a playing surface before an important tournament. The electric reel motors on the 7500A and 8000A E-Cut™ Hybrid Fairway Mowers are brushless, allowing them to be compact in size, roughly equal to that of today's hydraulic reel motors. The brushless motors are very efficient, leading to years of optimal performance with very minimal maintenance, and sealed for protection from the elements. The motors are bidirectional and variable speed, meaning they can spin forward or reverse and at a range of rotational speeds. 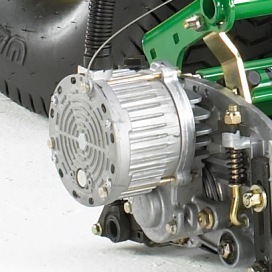 The motors spin forward for mowing operations and backward for backlapping operations. A poly-chain belt connects the motor shaft to the reel and rotates the reel when the cutting units are engaged. The internal components of the motor are sealed for long life, durability, and protection from the elements. Cutting units are easily removed from the cutting unit motors by loosening the two bolts securing the motor to the cutting unit, turning the motor approximately a quarter turn, and pulling the motor from the cutting unit. This can be done in a matter of seconds. A tether prevents damage to the wiring harness when the motor is removed. 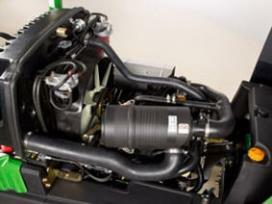 The reel circuit is powered by a 48-V, 180-amp alternator belt-driven by the engine. 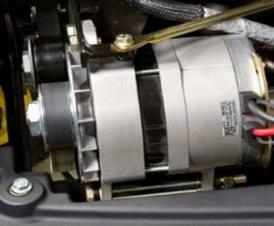 The alternator supplies constant power to the reel circuit and only generates 48 V when the mow system is engaged. Due to this design, no additional batteries are required to drive the reel motors on the 7500A and 8000A E-Cut™ Hybrid Fairway Mowers. With traditional electrical mowing systems, the frequency of clip would change as the batteries drained while mowing. A battery pack begins to lose its power immediately when used, but not on the E-Cut Hybrids. Since they still use an engine to drive an alternator, the frequency of clip at the start of the day and at the end of the day is exactly the same, yielding unparalleled quality of cut from start to finish. 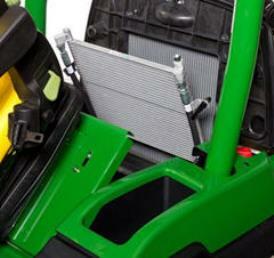 Plus, the machine doesn't have to be plugged in to charge the batteries once the day's mowing is done. The only limitation on run time with the E-Cut Hybrids is making sure the operator starts the day with a full fuel tank, just like with any other gas- or diesel-powered machine on the market today. The alternator only supplies power to the reel circuit. The remainder of the circuits are powered by a 12-V battery. 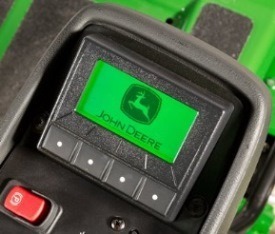 Passcode-protected TechControl display enables quickly setting or changing mowing speed, turning speed, or transport speed to limit variations in performance by different operators. Quickly adjust the mow or transport speed to make sure mow speed is what is needed for the changing conditions. The setting can be adjusted precisely using a speedometer app on a smartphone or GPS device. Use the TechControl to slow the machine during turns while mowing and protect against turf scuffing and aggressive turning operators. The turn speed control engages when in mow and the cutting units are lifted for turns. Once the turn is made and the cutting units are lowered, the machine speed returns to the set mow speed. The turn speed is a percentage of mow speed. 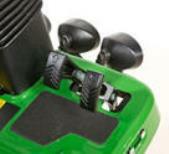 When set to 100 percent, turn speed control is off or allows 100 percent of the mow speed in turns. Turn speed setting of 50 percent allows only 50 percent of the set mow speed to be reached during turns. Choose from a list of several languages to use for the TechControl. Operator warning notifications are incorporated into the TechControl and will alert the operator if a problem arises during operation. The A-model PrecisionCut™ Mowers, E-Cut™ Hybrid Mowers, and TerrainCut™ Mowers have the latest in advanced diagnostics through the TechControl display. Most all diagnostics are performed while sitting in the operator’s seat. The TechControl has onboard visual diagnostics allowing quick and easy machine diagnostics, maximizing up time. The system allows technician to see inputs and outputs of the electrical system. Also, the technician can see stored controller codes on the machine to aide in troubleshooting incidents that may have occurred while on the course. The TechControl will also display the notification for maintenance of the hydraulic and engine oils using service timers to notify when it has reached the time to perform the required service. The eHydro™ traction pump and wheel motors in the new A-model takes performance, traction, and operation to the next level. The new system was designed to take on the most challenging course conditions. These improvements to the traction system makes the A-models ideal for undulating terrain providing superior performance and traction out on the course. The traction system in the A-models is driven by a servo-controlled hydrostatic pump. 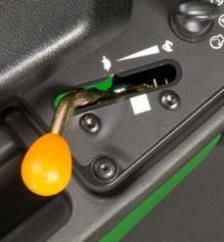 The control of the pump is no longer mechanical linkages but instead it is electronic. In total approximately 94 parts have been eliminated from the traction drive system along with 4 adjustments compared to prior models. The design reduced the complexity of the drive system meaning no more linkages to adjust or repair decreased routine maintenance and providing reliable day-in/day-out operation. The operator will like the eHydro, too. The pedal effort has been reduced, thus reducing the foot fatigue during many hours of mowing. For superior traction with a true hydraulic four-wheel drive (4WD), the GRIP All-Wheel Drive Traction System is optional equipment for the PrecisionCut™ and E-Cut™ Hybrid Fairway Mowers. This system reduces wheel slip by sending flow from the front wheel to the opposite rear wheel. For example, if the front right wheel starts to slip, hydraulic flow is diverted to the left rear wheel to maintain positive traction. By allowing the flow to cross over to the opposite rear wheel, the system maintains traction not only while climbing straight up hills, but also on side hills, as well. The GRIP All-Wheel Drive Traction System is always engaged when driving forward with the PrecisionCut and E-Cut Hybrid Fairway Mowers. There are no electronics to engage the 4WD system, simplifying the electrical system and the design of the valve at the rear of the machine. In reverse, a standard switch is provided that disengages 4WD. The switch senses that the reverse pedal has been depressed and shuts off flow to the rear drive wheels. This ensures that the front drive tires are doing the work in reverse rather than the rear tires, minimizing wheel slip and scuffing of turf when backing up an incline. 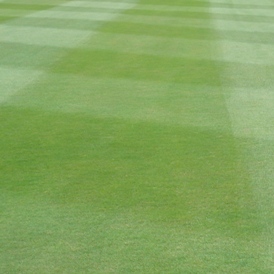 Ever wanted stripes as straight as they are on the greens? The A-Model PrecisionCut™ Mowers and E-Cut™ Hybrid Mowers do exactly that. Utilizing the same style steering cylinder as on the 2500B PrecisionCut and 2500E E-Cut Hybrid Riding Greens Mowers, the PrecisionCut and E-Cut Hybrid Mowers can mow the straightest lines of any mower in the industry today. 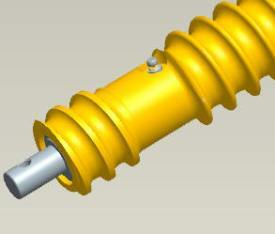 Traditional hydraulic cylinders have a rod on only one side of the cylinder. The cylinder on the A-models has one rod that goes through both sides of the cylinder. This equalizes volume and pressure on both sides of the cylinder packing, helping the operator make perfectly straight lines with little effort. This system also equalizes the steering effort, meaning easy turns whether turning to the right or to the left. When considering a fairway mower's effects on turf compaction, there is more to it than just weight alone. Weight is only a small factor in determining turf compaction. A key component is the selection of tires used on the machine involves both sizing and tread patterns. 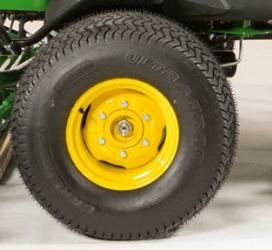 The John Deere PrecisionCut™ and E-Cut™ Hybrid Fairway Mowers use large, 26x14-12 front tires for proper front weight distribution, and 20x10-8 tires in the rear to distribute the rear weight. 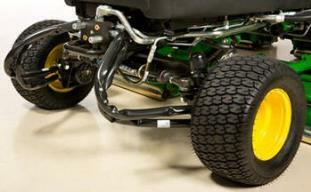 Both tires use a turf tread to maximize turf friendliness. They excel in weight distribution providing low ground pressure onto the turf. 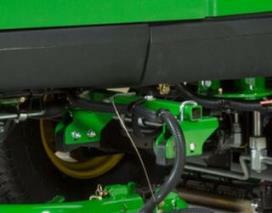 This provides less tracking, less marking, and less compaction. Easier daily maintenance points are designed into the machine to assist operators with complete daily maintenance and to keep the machine running at peak performance, saving valuable time and money. For ease of service, all daily engine checks are easily accessible by raising the hood. These service points include an engine-oil level check, a coolant level check, hydraulic fluid level, and an air-restriction indicator. The A-model PrecisionCut™ Mowers, E-Cut™ Hybrid Mowers, and TerrainCut™ Mowers feature a radiator screen easily removed without tools and tilt-out oil cooler for easy cleaning. The MTSpiral roller and the MTGrooved roller (not shown) options are available for Quick-Adjust 5 (QA5) cutting units to minimize roller overlap marks. The MTSpiral roller and the MTGrooved roller options take the patented 50.8-mm (2-in.) machine spiral roller to a whole new level. These designs reduce the number of times the grass is rolled in the overlap area of the cutting units. With these unique designs, the material in the overlap of the roller is machined down to a smaller diameter, allowing the ends of the rear cutting unit rollers to roll through the open space of the front cutting unit rollers. There are two types of overlap marks: reel overlap marks and roller overlap marks. It can often be difficult to determine what type of overlap marks an operator may be experiencing. In general, a roller overlap mark is roughly 88.9-mm (3.5-in.) to 101.6-mm (4-in.) wide, while a reel overlap tends to be 63.5-mm (2.5-in.) to 76.2-mm (3-in.) wide. 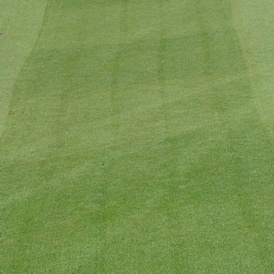 A roller overlap mark is caused by how many times the front and rear rollers of the cutting units go over the turf. With traditional roller setups, the grass is rolled four times in the overlap of the front and rear cutting units – once by the front roller of the front cutting unit, once by the rear roller of the front cutting unit, once by the front roller of the rear cutting unit, and once by the rear roller of the rear cutting unit. The rest of the cutting unit roller surface, not in the overlap, rolls the grass twice, once by the front roller and once by the rear roller. In certain conditions, particularly in times of lush growth, this may result in overlap marks, which will be darker striping marks in the dark stripes and lighter striping marks in the light stripes. 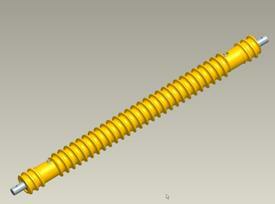 The MTSpiral roller and the MTGrooved roller change the game in terms of roller overlap marks. Due to their design, at no point is the grass rolled more than twice. At every point across all five cutting units, the grass is rolled exactly two times. What this means is a more uniform appearance across the cutting pass. If a customer decides the MTSpiral roller or the MTGrooved roller is the right choice to meet the needs for their application, it is recommended that both front and rear rollers be replaced with the MTSpiral rollers, or MTGrooved rollers, to achieve optimum performance and minimize overlap marks. Since these are spiral and grooved rollers, they will tend to engage the turf more than a cutting unit setup with a smooth rear roller. A starting guideline is that all cutting units equipped with front and rear MTSpiral rollers, or MTGrooved rollers, be set up with a benchsetting of at least 1.1 mm (0.05 in.) higher to achieve a similar effective height of cut. Proper height-of-cut setting is critical for this setup. The optional MTSpiral roller or MTGrooved roller setup does not solve issues due to reel overlap marks. Height-of-cut when the MTSpiral roller or MTGrooved roller is used should be measured by placing the gauge bar approximately 101 mm (4 in.) from the end of the roller to stay away from the tapered ends. MTSpiral rollers and MTGrooved rollers can be installed on all PrecisionCut™ and E-Cut™ Hybrid Fairway Mowers and Riding Greens Mowers with QA5 cutting units. They are an addition to the lineup of roller options for fairway, tee, and approach applications, and may help reduce roller overlap marks on both warm season and cool season turfgrasses. 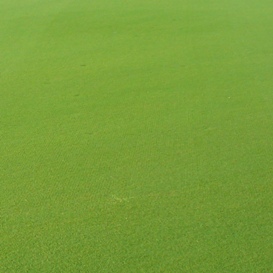 Use of the MTSpiral Rollers or MTGrooved rollers is not recommended for greens applications. Available for both the 45.7-cm (18-in.) and 55.9-cm (22-in.) cutting units, the MTSpiral roller and MTGrooved roller feature a true 45.7-cm (18-in.) and 55.9-cm (22-in.) length with tapered ends. This full-length roller, as compared to other shorter rollers in the marketplace, supports the cutting unit in turns and on sidehills without the gouging or marking. The 6500A, 6700A, 7500A, 7700A, and 8700A PrecisionCut™ and 7500A E-Cut™ Hybrid Fairway Mowers all have cutting units that contact up stops for transport. These up stops are rubber and limit cutting units from swinging during transport. The lift system also folds the two wing units inside the tires to limit possibility of damage to the wing units when transporting through and around objects on the course. The grooved disc roller can be used with 55.9-cm (22-in.) QA5 cutting units, in combination with the GTC and FTC, to provide additional roller options for fairway, tees, and approach areas. The increased diameter improves the durability over smaller rollers, and it features hardened discs for improved wear which retains spring tension for reduced maintenance, making it an ideal roller for fairway, tee, and approach mowing.